A quick search on eBay for peignoir sets and you'll find two common lengths: the full length (often with long sleeves), and the baby-doll length, which often has added trim/lace/ruffles around a voluminous hem. 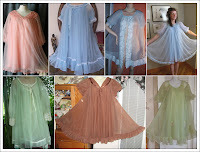 Sleeve lengths vary, but they all close at the center top with a button or bow. Even though you can't see Magenta's full robe, my best guess is that it's a baby-doll style peignoir. The sleeves and back are transparent, but the front is not. Watching the film frame by frame, my best guess is that the sleeves are about elbow length (when her arms are down), it's open in the front, there's some trim around the neckline and an additional ribbon/bow on the sleeve right above the marabou trim. If you can't find beige marabou trim, you can stain it with coffee or tea. Rinse thoroughly then stick it in your dryer. It will come out fluffy and beige - with a hint of caffeine.